IS YOUR DEFIBRILLATOR STILL IN ITS BOX? Firstly, if you have recently purchased a defibrillator for the safety of your staff, clients and visitors, then we applaud your actions because you are clearly thinking about the wellbeing of other people and increasing the chances of saving a colleague's life. However, in reality, you have only completed Step One of a Three Step process! As an experiment, we called in on an organisation that had recently bought a defibrillator and we asked if we could take a look. It was very easy to find as it was prominently placed in their storeroom. However, it was still in its box, all nicely sealed up by the manufacturer before posting. By this stage, ten minutes had passed. If this had been an emergency situation, we would probably have been far too late to offer any useful assistance to the patient having the heart attack! So, you will have worked out that Step Two of the process is to ensure that the defibrillator is all set up and working and ready for action. Now, just imagine how terrifying it would be to see someone you know having a heart attack. The harsh reality is that most people will either freeze, hoping desperately that someone else will take the responsibility, or will panic. So, do not be misled about the "ease of use" of modern defibrillators - that's NOT the issue. Step Three is to get proper training to give you and your staff the knowledge, practical experience and, above all, the confidence to step up and save a life. To order the new Zoll AED Plus defibrillator WITH full training for 8 people, please click here. "The content level was 'excellent' and the course was the 'best ever'. The standard of instruction from Dawn was 'brill'...!" As well as running scheduled public courses on a wide variety of health and safety areas, we also run in-house courses for organisations, often onsite using their facilities. There are many benefits of this approach, the main one being cost. It is usually more cost-effective for your organisation to train eight or more people on site than to send them on any public courses. Our in house courses are more flexible, we agree the date and time that suits you and your delegates don't need to spend time and money on travel to the course venue. Furthermore, we can tailor each in-house course so it is specific to your industry and more focussed on the areas that directly apply to your organisation. By using real-life examples that could occur in your workplace, your delegates are more likely to relate directly to the content and to remember the skills they have learnt. We have also found that when delegates from different departments and levels mix together on the same in-house course, this actually encourages team work and an appreciation of each other's roles in the same organisation. Sometimes a work-related challenge or sensitive issue may emerge but this can be discussed in a private environment with no concerns over competition or people outside the business. As an example, we have recently put together a Paediatric First Aid Course for organisations running Children's Summer Clubs. It's completely tailored to their requirements and therefore represents excellent value in both time and cost to their organisation. 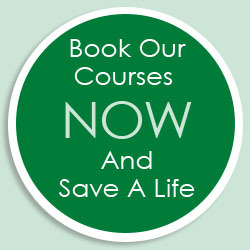 To discuss your own tailored "in-house" course, please email us at info@ocfa.co.uk or call us on 01235 810619. "Oxford...scorchio!" says Paula Fisch, Channel 9 Weather Correspondant for "The Fast Show". In fact, it was hotter in Oxfordshire than it was in Rio de Janeiro! So in this month's Hints and Tips, we're looking at heat exhaustion and heatstroke. Heat exhaustion and heatstroke need to be treated quickly. If you suspect someone has heat exhaustion, follow the advice outlined below. Get them to rest in a cool place – ideally in a room with air conditioning or, if this is not possible, somewhere in the shade. Get them to drink fluids – this should be water or a rehydration drink, such as a sports drink; they should stop taking fluid on board once their symptoms have significantly decreased (usually within 2-3 hours). Avoid alcohol or caffeine because they can increase levels of dehydration. Use cool water (not cold) on their skin – if available, use a cool shower or bath to cool them down, otherwise apply a cool, wet flannel or facecloth to their skin. Loosen clothing and ensure the person gets plenty of ventilation. Dial 999 to request an ambulance if the person doesn't respond to the above treatment within 30 minutes. Congratulations to Hannah Sichel from Mogford Limited, who correctly answered that it is The Cherwell that is spanned by Oxford's Magdalen Bridge. Hannah wins a £50 voucher for a meal for two at The Mole Inn at Toot Baldon and just 5 miles from Oxford. This month, we are offering a £50 voucher for a meal for two at Fallowfields Country House Hotel - a Three AA Rosette Restaurant set in the stunning Oxfordshire countryside in Kingston Bagpuize. "What is the name of the fair held in Oxford in September each year?" Email your answer and contact details to Jane at: info@ocfa.co.uk and we'll draw one lucky winner from the correct answers on Friday 17th July 2015.